The 28 exclusive pool villas have been created to tailor to every stay, whether a couple who appreciates intimate privacy, a small get-together of friends and families, or a glad reunion. 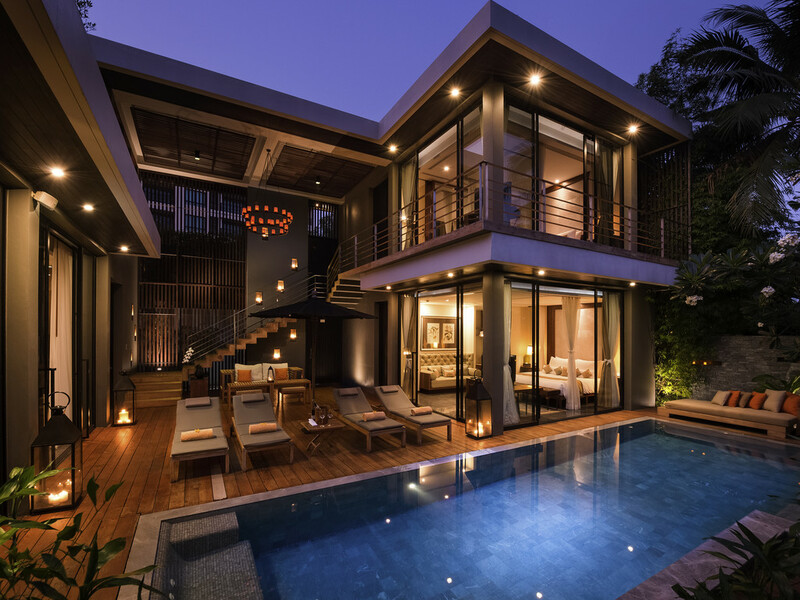 Designed to accommodate the intimate romance of couples. A large bedroom with king-sized bed, an en suite bathroom featuring a rain shower and twin Jacuzzi. The private garden features a 9 x 3.75 metre swimming pool and tables for alfresco dining. Two large bedrooms, each with a king-sized bed, an en suite bathroom featuring a rain shower and twin Jacuzzi. The private garden features 9 x 3.75 metre swimming pool, sun loungers and tables for alfresco dining. The two-storey villas include 3 large bedrooms, each with a king-sized bed, an en suite bathroom featuring a rain shower and twin Jacuzzi. The private garden 9 x 3.75 metre swimming pool and tables for alfresco dining. Butlers are on hand 24 hours. Room service available as per guest order. Weekday hours : 07:00 - 23:00 hrs. Weekend hours : 07:00 - 23:00 hrs. Coffee Maker in all villas. A romantic dining experience awaits you, with your table submerged and surrounded by water while you enjoy a view of unmatchable serenity over the resort's infinity pool and the beautiful horizon of the Gulf of Thailand. A new perspective for successful business meeting or closing a deal, V Villas offers you the best intimate location with state-of-the-art facilities, a flexible meeting space, flawless attention to detail. Our weddings planner is ready to assist your every need, from arranging the ceremony and flower decoration to make-up & dress-up, and superb entertainment. A wedding on the beach in Hua Hin is the perfect location for an intimate wedding to celebrate this special occasion. 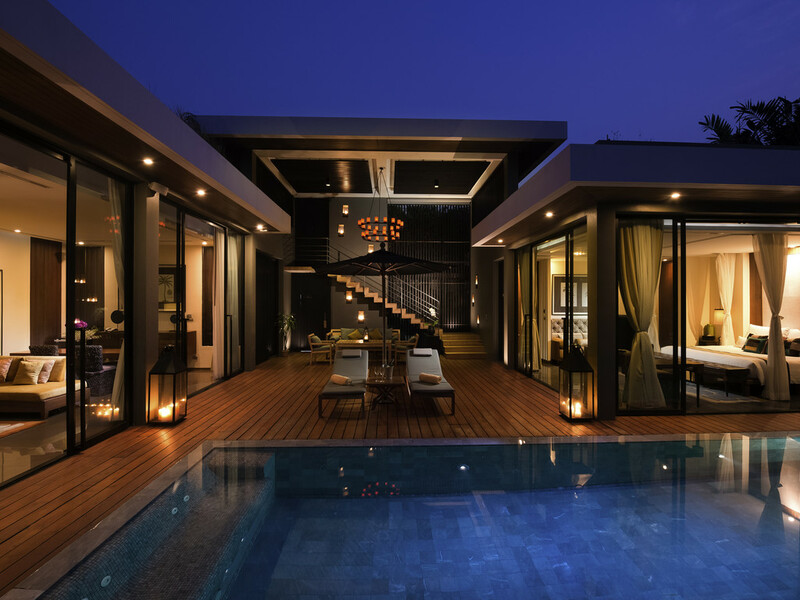 V Villas has been recognized as one of the best wedding venues in Thailand for privacy and exclusivity. 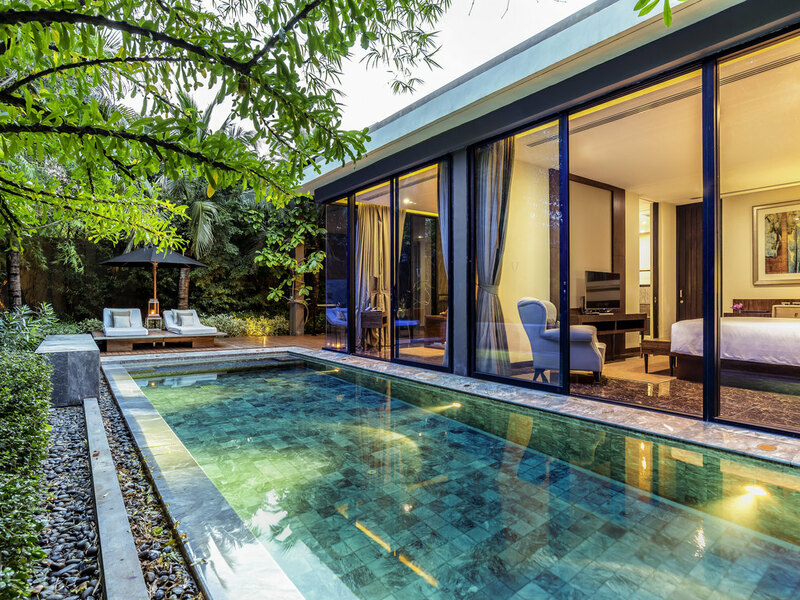 V Villas Hua Hin is your own private haven where guests can enjoy a life of secluded luxury in a serene natural setting. The perfect place to find respite and relaxation, V Spa is staffed by professional therapists and offers and extensive menu of traditional and contemporary treatment including spa package. Ensconced in the privacy of V Villas Hua Hin, you can enjoy a luxurious seafood BBQ at your private pool by the chef. When total relaxation is called for, V Spa offers a menu of treatments designed for wellbeing of the mind and fitness facility.